The front cover of ATG’s GDPR guide. Download the pdf of the full guide below. What does the scary-sounding ‘General Data Protection Regulation 2018’ have to do with me, you may well ask? A lot, if your business captures information on buyers, clients, employees and companies you might work with. This is reason why Antiques Trade Gazette has produced an in-depth guide to this area. We are not dispensing legal advice, but rather have consulted expert sources to familiarise you with key aspects of the GDPR. The people quoted in this guide say that while concerns about the new rules are understandable, a common-sense approach to compliance is best. 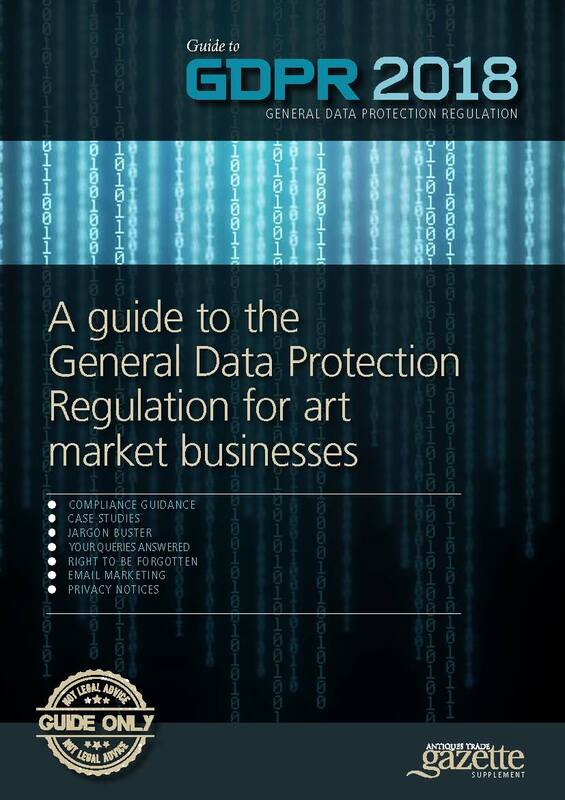 * Please note this guide is provided as a background resource to help the art market understand the implications of the GDPR and the need to be compliant. It does not cover all the issues that may arise nor does it constitute any form of legal advice and should not be treated as a substitute for specific advice from a lawyer. Art market professionals are also referred to the ICO website (ico.org.uk) where more specific and detailed guidance is provided and a helpline offered.